The Celestron 127EQ PowerSeeker is quite simply the most powerful telescope you can buy at this price range. It’s also a very good looking, well made device, and is widely regarded as the best combination of power, price, and performance. 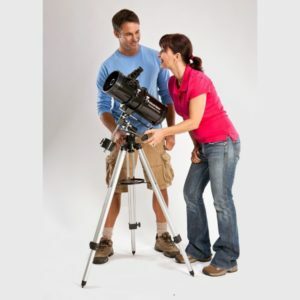 Celestron is one of the best known manufacturers of telescopes for home use, and this reputation has been gained by years of making high quality, yet affordable products. The Celestron 127EQ PowerSeeker is a great little beginner and refractor telescope. Most entry level scopes at this price range are junk but this one holds its own. 5 inch Aperture for under 150 bucks is very reasonable. the optics are good, it has a large aperture, a solid mount, and comes with one useful eyepiece. I want to start by saying this is a very good starter beginner-intermediate level scope would recommend this telescope because it is the most powerful one you can get in its price range. The Celestron 127EQ PowerSeeker is a Reflector, or Newtonian telescope, meaning that light enters an aperture at one end, is bounced off a mirror, and picked reflected into the eyepiece. This bouncing of light effectively doubles the focal length of the telescope, increasing magnification in a shorter tube. The 127 of the name refers to the 127mm aperture size, (5”), and the focal length is 1000mm (40”), making this a fairly powerful telescope, well able to see the rings of Saturn, and distant galaxies and nebulae. In the kit, you will find the following – Telescope tube made of sturdy aluminum, with a specially designed mirror housing. This housing minimizes the need for ‘collimation’, or mirror adjustment, which can be tricky for a newcomer, but is actually not too difficult. Full instructions are included. You will also get two eyepieces, one of 20mm, with 50x magnification, and one of 4mm with 250x magnification, as well as a 3x Barlow lens, which effectively triples magnification. Don’t get carried away with these figures though. With telescopes, the maximum magnification is usually irrelevant. If you looked at an object at the maximum magnification with this telescope, it would be a blurry mess. So always look for the maximum useful magnification, which in this case is a still very impressive, and class-leading, 200x. All lenses and mirrors are coated with aluminum and quartz, to give long life, and sharp images. The eyepieces also have anti-reflection coatings so you are not looking at a reflection of your own eye when looking down them. Attached to the tube is a 5 x 24mm Finderscope. This helps you to locate objects by looking down the viewfinder and aligning the object with the crosshairs. The mount features slow motion controls for smooth, easy tracking of objects, and this is aided by the inclusion of a counterweight, which makes moving the telescope tube even easier. To find objects, the mount has ‘setting circles’. Following the instructions, you first line the mount up with the Celestial North Pole. With a star chart, or co-ordinates of the object you wish to view, you turn a control knob on the setting circles to the correct Right Ascension (left/right), and Declination, (up/down). It’s easy to get the hang of this, so if you are new to astronomy, don’t worry, it will soon be second nature. The mount really is a well engineered piece of kit, especially for the budget. The Aluminum Tripod is fully adjustable, easy to fit, and comes with an accessory tray which serves the dual purposes of holding spare lenses and keeping the legs correctly splayed. Quick and easy no-tool setup. Erect image optics – Ideal for terrestrial and astronomical use. Fully coated glass optical components with high transmission coatings for enhanced image brightness and clarity. It is a great starter telescope to see good definition on the moon. This unit is easy to assemble and is a great unit. this scope makes it very easy to track a star across the sky as the Earth turns. It only requires the turn of a single knob. For the price, this telescope is highly recommended. If you are a beginner, you can buy this one safe in the knowledge that it will last you for years, and you can upgrade it easily by purchasing additional lenses. Overall a good investment if you want a good entry level scope that won’t break your bank and are willing to upgrade a few things somewhere down the road, The Celestron 127EQ PowerSeeker is a winner. if you are new at astronomy and didn’t want to spend too much for a telescope, this is best for you!